The key to using “upper structures” is to observe that simple major and minor triads exist in the upper reaches of altered dominant chords. These structures are often used by pianists and guitarists in chord voicings, but they are also very effective in solo lines. Had you considered that you can play, for instance, an F#m triad over C7b9, or an F major triad over A7alt? Excuse the technically incorrect enharmonic spellings. They’re actually part of the deal when you’re dealing with an unexpected chord over another. 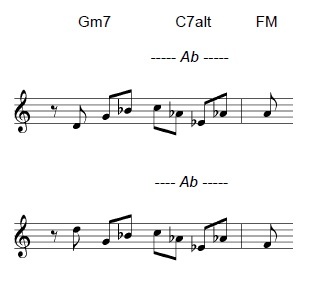 Note that F# and Ebm triads fit both chord types. Other triads are possible, but not as useful because they don’t include enough interesting chord tones. The way to internalise these in all keys is to think of them in Roman numeral notation. So Upper Structure #IV is a major triad built on the #IVth degree of the home chord (in the case of C, this is F#). Upper Structure bIIIm is a minor triad built on the bIIIrd degree (in the case of C, Ebm). And so forth. Oh, and any of these figures can be adapted for use over a minor II-V-I – just flat the 5th on the II chord and flat the 3rd on the I chord. The altered chord-scale is a mode of the melodic minor scale. For instance, C7alt is the VIIth mode of Db melodic minor. This means that the upper structure triads that work over C7alt will also work over all the other chord qualities from that “parent” melodic minor scale. The chords given in parentheses are less commonly used. So you can use the relevant upper structure triads interchangeably over all these chords. Ultimately, you really need to know all the chords from melodic minor as a set or family in every key. Do strive for this, but I’ll admit it’s a bit of a headful, so why not start by picking a few favourite upper structure triads over, for instance the half-diminished and tonic minor chords that appear in the standard repertoire you play. As you look through the chord changes to a standard, decide in advance on certain upper structure triads that you’re going to drop in over particular chords. For instance, over the first two chords of Stella by Starlight, you could preplan a D major triad over the Em7b5 and a C minor triad over the A7alt, and aim to hook the two together smoothly when you take your solo. It’s probably least confusing to internalise thoroughly the upper structure triads on 7alt chords first and then learn the melodic minor chord families later. This is a quite demanding piece of book-bashing, but it’s well worth it – it will totally change the way you play. Good luck with this approach, and feel free to contribute your ideas below. Great blog! Interesting and entertaining reading. Just wanted to point out to students that you kind find examples of this throughout be-bop and post bop tunes. It’s good to identify this kind of thing in actual jazz music in your transcriptions and repertoire. It probably started with swing players using m6 chords on dominants – for example you’d play Dm6 on a G7 chord, creating a G9 tonality – Lester Young was very fond of this. Charlie Christian uses some mad ones – Bbmin over C7, Em6 on A7 in the key of D minor and so on. A classic example of minor triads in the upper structure of an altered dominant in the bridge of Hot House. Great tune to study for minor ii-V-I and altered dominant language. The great thing is you can get the chord/scale sound while playing a strong melodic line rather than a bunch of steps and half steps. Like you say elsewhere the upper structure or substitute sound is generally played pretty simple. Just a descending or ascending arpeggio with a strong rhythm will sound hip enough on its own. Hope all is well with the TL gang. Hi Chris – thanks for chipping in there. I’d say that Bbm over C7 could be seen as a susb9 sound (effectively using a minor turnaround in a major context) and Em6 over A7 in D minor could be the reverse – using a major turnaround in a minor context. Either that or they were just being naughty boys and played what they felt like and hang the changes! Haven’t seen you in a while. Bring your axe down sometime. Some great info on these pages. Back to the woodshed for another six months. 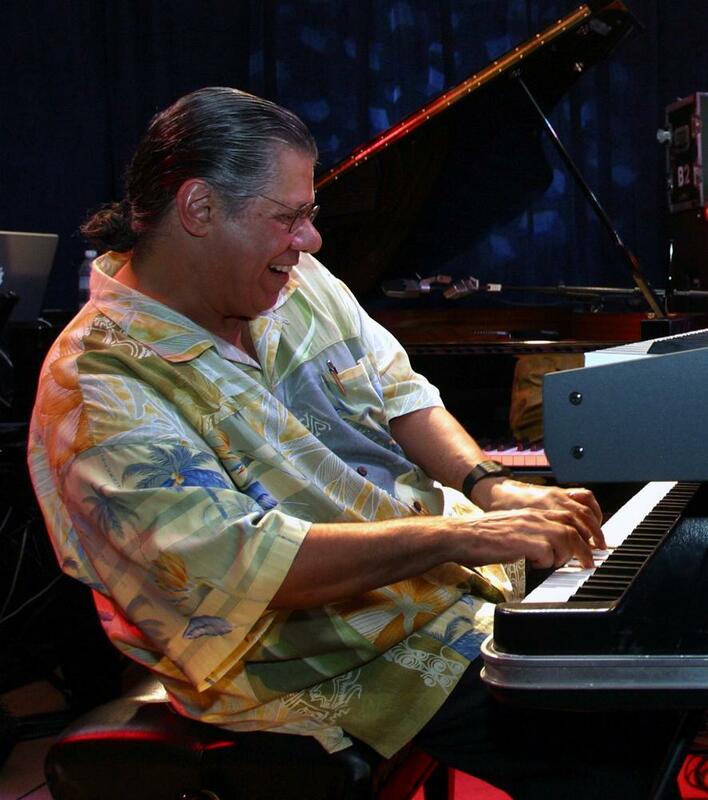 Here’s my 3 chord, Louie-Louie take on adding minor-ish or bluesy notes to upper structures…I know of only 2 others that consisently use the whole system: Thad Jones and Keith Jarrett. And, no, I don’t need to be told that it’s an alt scale: this is about using i-IV-V triads as melody generators. Scales are just scales. Thank you for translating the article.